Dubai: The world's highest-altitude restaurant, called At.Mosphere, opened on the 122nd floor of the Burj Khalifa yesterday, the latest addition to Dubai-based developer Emaar's growing food and beverage portfolio. "It is a momentous occasion for Emaar Hospitality and for Dubai," said Marc Dardenne, CEO of Emaar Hospitality. The concept of a restaurant at the top of the tower was in place from the planning stage of the tower, he added. It is launching a little more than a year after the building's official opening in January 2010. "It's a proud addition to our lifestyle portfolio. It was always in the plan, and the opening now is very timely to get something in the new year,"said Dardenne. At.Mosphere is in addition to two operations already under Emaar's hospitality arm, Madeleine Cafe and Downtown Deli, both in the Dubai Mall. "We're going to grow with the Madeleine Cafe brand which has been very successful," Dardenne told Gulf News. "For At.Mosphere, we can see in the future that we may export the brand outside of Dubai." 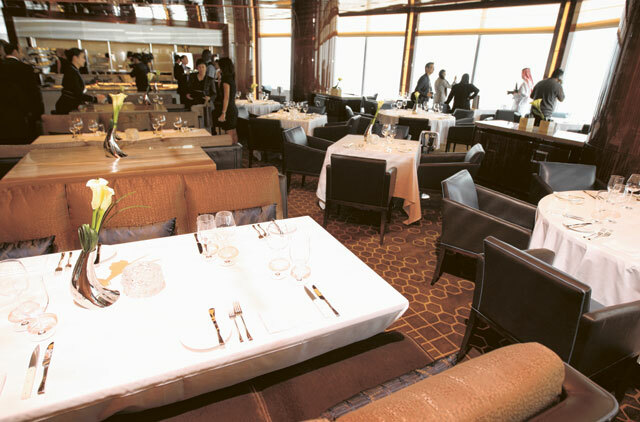 The restaurant and lounge bar is located two floors below At The Top, the public observation desk of the world's tallest building, and is reached by its own double-decker high-speed elevators, accessed through the Corporate Suites entrance. Entry to the restaurant and lounge is by reservation only. The restaurant will be open for lunch and dinner, and the lounge is open from noon until 2am, serving drinks, small dishes of food and afternoon tea. All areas of the restaurant have floor to ceiling windows, as does the kitchen, which is located in between the two areas of the outlet. Dwayne Cheer, At.Mosphere's executive chef, describes the outlet as a "contemporary grill", with a focus on sustainable ingredients, especially fish. Menu items served on opening day included a starter of pan-seared scallops with ricotta dumpling (Dh145), a main of beef short ribs (Dh240) and a pear compote dessert (Dh80). Prices for starters range from Dh110 to Dh360, while mains run from Dh180 to Dh590. Diners will be charged a minimum spend of Dh450 per person in the restaurant, and Dh200 in the lounge. "The pressure is high and the expectations are as high as the building itself," Cheer said when asked if he can live up to hype of cooking at the top of the world's tallest building. "Come and eat the food," he said. "We want people to come here and forget about the view, and concentrate on the food, talk about the food, and have to come back because they forgot to look at the view."